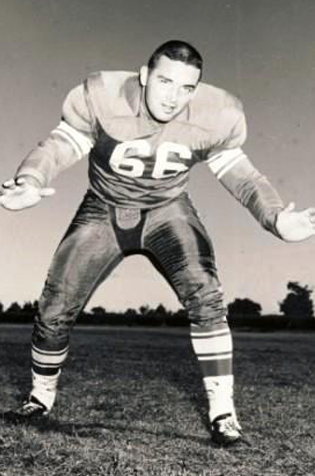 Al Benecick joined the Saskatchewan Roughriders via the Philadelphia Eagles’ camp in mid-1959, following his graduation from Syracuse university. Benecick was a tough Offensive Guard and Tackle who commanded respect from friend and foe alike. During team drills in 1965, teammates were reluctant to line up opposite Benecick preferring to practice against a less difficult opponent. He was the club’s nominee for the Schenley Outstanding Lineman award on three occasions. He appeared in the 1966 and 1967 Grey Cup games, celebrating victory with Saskatcewan in 1966, their first ever championship. He completed his stellar career in Edmonton where he played four games before deciding to retire. Al Benecick was inducted to the Saskatchewan Roughriders’ Plaza of Honour in 1991.